Arthur Schlesinger, Jr. called him "the most creative man in American public life." Ronald Reagansaid, "He aroused the comfortable. He exposed the corrupt, remembered the forgotten, inspired his countrymen, and renewed and enriched the American conscience." The Department of Justice Building is named for him; so is New York City's Triborough Bridge. Hillary Clinton used his life and words to frame her speech denouncing America's use of torture, and Barack Obama invoked him in his remarks at the fiftieth anniversary of the civil rights marches in Selma. Robert F. Kennedy's vision and message resonate today as much as they did 50 years ago, when he was tragically struck down by an assassin's bullet. He was the inspiration of a new generation, and the hope of a country. We can learn much from his words and example. But to each generation, the anniversary of RFK's presidential campaign, and death, brings something different. For those of a certain age, it instills a nastalgic longing for the days of "Camelot," when John F. Kennedy, Jackie and their family occupied the White House, and Americans basked in the glow of youthful inspiration felt worldwide, and the promise of leadership that would deliver peace at home and abroad. It is also a vivid reminder of the birth o f the civil rights movement and the struggles that led to the enactment of the Civil Rights Act of 1964 and Voting Rights Act of 1965. For another generation, mine, it represents one of the most consequential and impactful decades in history, one not shared in our own experience, but one that empowered in us an understanding of those who sacrificed before us to advance individual rights -- for women, minorities, and the disenfranchised. 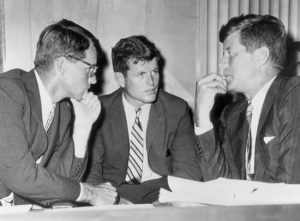 Our Kennedy was Ted, the progressive champion and "Lion of the Senate" who, true to his word after RFK's death, would carry on his brothers' "commitment to justice, excellence and courage that distinguished their lives." The Clinton-Gore Administration provided us with our first taste of that kind of inspiration and vision, and the ability to truly participate in progress and policies that affect change. We saw it slip away and then, through the eyes of a new generation, experienced the historical election of Barack Obama, and its awakening to a visionary and camelot of their own, and the momentum of a movement not unlike that championed by John and Robert Kennedy. And, like those who saw hope snatched from their grasp after the deaths of Martin Luther King, Jr. and Robert Kennedy, they are experiencing for the first time, the reality of loss and the consequences of inaction. Whether they truly understand the magnitude, under the Trump administration, of the daily rollback of hard-fought rights previously presumed to be guaranteed protections under the constitution, is unclear. What is clear, however, is that in the age of internet accountability and transparency, online activism does not approach the reality of what needs to be done, hands-on, in the field and at the ballot box. But they, like all of us, are looking for leadership that will guide us in that fight, someone who not only holds the promise of healing the many wounds of the Trump era, but who can inspire in us the courage and commitment to help ensure that it never happens again. Our nation would be forever changed by the events of June 6, 1968, but the beacon of hope provided by Bobby Kennedy's vision for our country need not, and can not, be permanently extinguished. 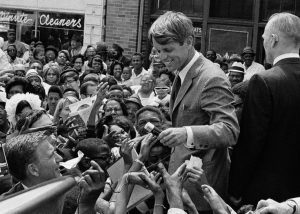 Just as RFK inspired a generation to get involved in politics, and galvanized a divided Democratic Party, so must we prepare to heal a nation and come together to triumph over the racial divides and prejudicial roots that still plague us, and have been nakedly exposed and exploited by a President who threatens our most sacred values. Like Kennedy, we are riding a wave of change, and, while we cannot alter the past, we can learn from it and be the ripples of hope he saw in each of us. As RFK famously said, quoting George Bernard Shaw, "There are those that look at things the way they are, and ask why? I dream of things that never were, and ask why not?" The words and the work of Bobby Kennedy live on through his family's ongoing dedication to public service and through the work of Robert F. Kennedy Human Rights.